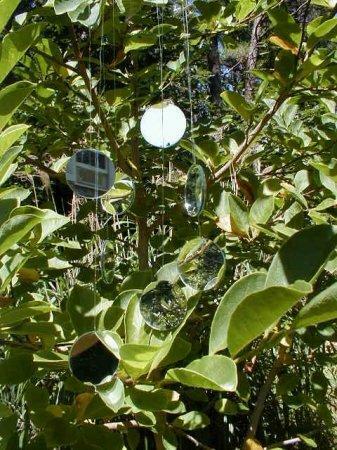 Add some sparkle to your backyard reception by hanging these small round mirrors in your trees. Do you think the birds will enjoy gazing at their own reflections? Imagine the delighted look on your younger guests faces when the catch sight of a tree filled with twinkling mirrors. Dance by the light of the moon? I wonder if they will also dance under the light of a full moon? Or shimmer with reflected flames from lighted garden torches? A touch of midnight romance to share after your guests have all departed. Add some long white ribbon strands to dance along with these mirrors from Dancing Garden Mirrors. This was written by admin. Posted on Tuesday, June 9, 2009, at 5:26 pm. Filed under Decorations. Tagged Decorations, Mirrors. Bookmark the permalink. Follow comments here with the RSS feed. Post a comment or leave a trackback.